Self-healing lessons from medical intuition pioneers Dr. Norm Shealy and Caroline Myss. What is your intuition telling you about your health right now? Are you sensing the influences within you that create your physical and spiritual well-being? 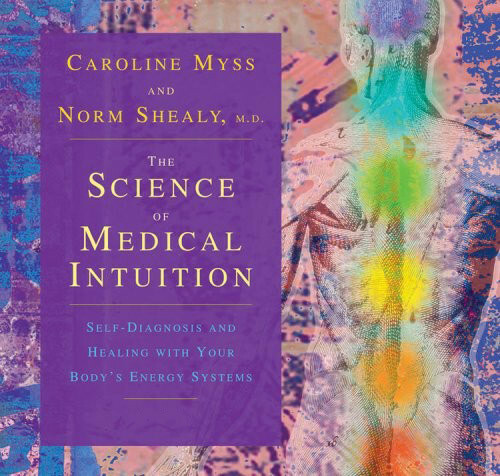 Caroline Myss is called America's #1 medical intuitive because of her documented 93 percent accuracy rate in a scientific blind study conducted by Dr. Norm Shealy, a Harvard-trained neurosurgeon, graduate of Duke Medical School, and founder of the prestigious American Holistic Medical Association two decades ago. One thing Caroline insists about her intuition: "This is not a gift. It's a skill." As Caroline puts it, "Nothing is more ordinary than discovering how extraordinary you and your powers are." The oldest known healing science originated in India more than 4,000 years ago. This all-natural system for vibrant health, used by millions of people, is based on the chakras—the seven vital energy centers of your body. Your chakras, Caroline teaches, hold the key to gathering energetic information beyond your five senses, because they are constantly transmitting information about your organs, your tissue, your mental and emotional states, even your spiritual purpose. After 35 years of groundbreaking research and study, Dr. Shealy has come to this clear conclusion: "To be truly effective, the practice of healing in the future must merge traditional medicine with a deeper understanding of the human energy system." Withthe Science of Medical Intuition online course, you are invited to begin using this medicine of the future in your life right now. Clearly, a multitude of factors affect your health, from your genetics to the environment. Many of these factors we cannot change. What you can control is your ability to perceive and influence the energetic conditions within you. Why not take charge of this crucial dimension of your health and well-being? With this milestone course taught by Dr. Norm Shealy and Caroline Myss, you can begin benefiting from their revolutionary tools today with lessons you can download and keep. This session explores the art and science of medical intuition and the evolution of human consciousness. Other topics include the management of energy and power leakages, asking intuitive questions, and how to call your spirit back to present time. The session's video lessons introduce the chakras—the centers of energy within the human body—and discuss in-depth the first chakra and its association with tribal power. An overview of the history of medical intuition and the work of the early pioneers in this emerging field—from Edgar Cayce and Carl Jung to Elmer Green and Alice Bailey and more. You experience the early work of Caroline Myss and some of the ethical aspects of practicing as a medical intuitive. This session's video lessons continue your exploration of the chakra system, including an in-depth look at the second and third chakras—the areas of relationships and personal power. Intuition is the natural state of all living beings; it is an instinct we all share. In this session, you begin to learn how to open to your own intuition, allowing it to flow freely in your life. Some 40 exercises are available to experiment with—throughout this course and beyond—designed to enhance your intuitive abilities and give you greater access to the power of the present moment. The video lessons continue with chakras four through six, which are associated with emotional power, the power of will, and the power of the mind. This session begins with an explanation of the holographic connection between the various systems of the body—physical, mental, emotional, and spiritual. After a brief discussion on the principles and benefits of guided imagery, you learn how to use the practice to feel areas in your body and balance your attitudes and emotions. The video lessons conclude with an in-depth look at the seventh chakra, your spiritual connector, and the importance of merging the spiritual with the physical. This session also includes a daily practice for aligning with the seven sacred truths as revealed by the chakra system. This session provides a guided tour of the first three chakras and begins to familiarize you with how these energy centers function in the mind, body, and spirit. Next you're guided through a series of specific questions designed to give you a direct and personal experience of chakras one, two, and three. Then you learn the importance of being impersonal in intuitive work and practice a powerful set of visualizations to help you begin reading your energy as it expresses itself through the first three chakras. The exploration of the chakras continues as you move above the waist and into the alchemical laboratory of chakras four through seven. Your goal in this session is achieving balance between the interactions of these four chakras for harmony of body, mind, emotions, and spirit. Again, you have the opportunity to reflect on a number of specific questions designed to take you into direct and personal experiences of these energy centers. The session concludes with a powerful set of visualizations that help develop your connection to these four energy centers. Caroline Myss has described three levels of power: tribal/physical, personal/emotional, and archetypal/symbolic. This session focuses on the third level—that of the archetypes—and the importance of understanding and working with these energies in your life. From Pioneer and Poet to Seeker or Student, you identify which of the numerous archetypal dimensions describe you best—an important process in developing your medical intuition that helps you to understand not only yourself, but also your relationships, from a higher perspective. In this session, you're introduced to the first four of the five Sacred Rings—energetic circuits that Myss and Shealy have developed and tested over the past 15 years. Through guided imagery and insightful tips, you learn how to work with and activate the Rings of Earth, Fire, Water, and Air as powerful tools on your healing journey. Earth, Fire, Water, and Air are all energetic rings that have to do with the daily maintenance of our energetic body. This session covers the final ring—the Ring of Crystal, which also assists in maintenance, but functions more importantly in regeneration. In this session, you learn how to stimulate the Ring of Crystal and help reduce free radicals—a key to remaining healthy and youthful. How do you receive intuitive information? This final session explores the uniquely individual process that we all go through in determining our own intuitive code—the organized way in which Spirit communicates with us and guides us in the most responsible use of our energy. From the nature of perception and how we make choices, to the price of low self-esteem and your commitment to the intuitive life, the lessons cover a variety of critical topics related to your life as a medical intuitive—concluding with an intuitive self-evaluation and discussion of where you might go from here.